''We're not a super high-scoring offense today as we speak; I think we're going to get better as the year goes on,” said Philbin in his weekly press conference. The Dolphin offense has contributed only five touchdown passes this season, which is last in the NFL. The 3.7 yards per carry ranks 27th and the Dolphins haven’t eclipsed 100 yards rushing since week 3. These numbers, 22nd in Scoring, 23rd in Total Yards, 23rd in Passing cannot be overcome by being 11th in rushing. The rushing statistic is not due to quality but quantity, Miami ranks 4th in attempts. The Dolphins have been out-gained 825-428 yards in the past two games, almost a 2 to 1 margin. Joe Knows the Miami defense is ranked 3rd in scoring and rushing, but the same defense is ranked 27th in passing and 22nd in overall yards. The one inspiring number is a league leading 26.4 third down conversion percentage. At -6, Miami’s turnover margin is ranked 24th in the league. The Dolphins are 4-3 and there is great optimism on the sidelines and in the fan-base, but the numbers seem to indicate it's all smoke and mirrors. Perhaps there is more at play than a grand illusion, consider the following chart courtesy of www.advancednflstats.com. Joe knows Dolphin fans will zero in on the Miami logo and notice it in the top left quadrant of the graph. The top represents the leaders in average field position yielded by the defense. The right side represents the leaders in average field position on offense. 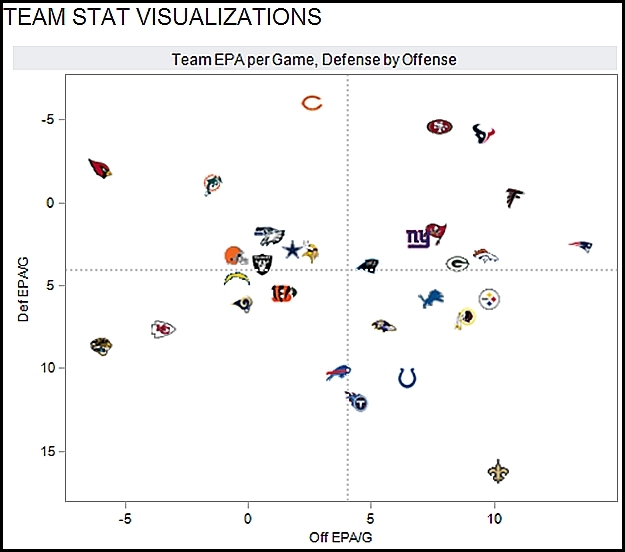 The top right are the teams that perform well on both offense and defense. Notice the teams in the upper right, San Francisco, Houston and Atlanta, then the teams in the upper left, Chicago, Arizona and Miami. The teams in the upper right quadrant are the best teams in the NFL, because they start on offense from a shorter field and their opponents start on offense from a longer field. The case of Miami, they are consistently forcing teams to take the long way home, while the Dolphin return game is average. The first thing fans should realize is, Joe Knows! In the words of Philbin, “Our defense is playing well on third down, they're playing well in the red zone, and we've got a pretty good punter.” By compiling the numbers we can begin to clarify the picture of why the Dolphins are winning with what seem to be an abundance of negative stats. The Miami defense is getting off the field on 3rd down causing the opponents to punt while still in their own territory. They are making teams one dimensional by shutting down the running game, and they are holding teams to field goals, which keeps scores manageable for the growing offense. But Joe knows he has to take some calculated risks to put his team at an advantage. ''Daring is usually not associated with me,'' Philbin said with a sly smile.